Spiffing March sunshine out there. Let's head to The 'Swich to take advantage of some outside seating On The Waterfront. Ain't worth me heading back to MH so may as well bike and meet the chaps there. Man, that wind catches your cargo shorts. Blown by that same wind, six years have flown by since we were last here. 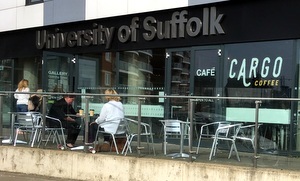 What was Theta is now Cargo and, more significantly, what was University Campus Suffolk is now The University of Suffolk, natch. Andy's already dispatching the last chicken tikka soup with naan, which looked mighty fine, and Kev's on the curried parsnip. Final jacket potato has just sailed away towards Shotley. Guess I'll have a bland-sounding BBQ chicken panini. Not bad at all and just about worth the wait. Has to be a good thing that the Ginsters have been swept aside by far more fresh food plus sausage rolls, wedge and pizza slices. Would have liked a better range of soft drinks. That's one small fridge. Haven't yet mentioned that we BBQ chickened out of the outside seating. Bit too breezy for the 50+ club. Still adjoining the cafe is the Waterfront Gallery, home to my "piece" back in 2011, and currently housing an exhibition entitled Simulacrum. Nice bit of culture, ain't it? Steady stream of students and staff seem happy enough. Quite a bit of choice around here these days with Coffeelink and Colours still going strong and the likes of Cult Cafe, Cafe Marina and Delice not far away. No great shock to see that Cargo's coffee is Costa-branded. Shame that they're not supporting Coffeelink, all of 50m away. Hot, wet and reasonably strong, and more than fine with a slab of prepack carrot cake. Occupying another table are some callow youths promoting the upcoming student elections. Despite my babyface, I'm not eligibile to vote. If it was a car -- (anything from Cargo Cars in Gorleston). If they were passing by -- Anthony Agogo.